Martin, of The Printing House of Townley, Webb & Martin, Inc., writes about a photograph for the cover of the Summer issue of the Highlander. 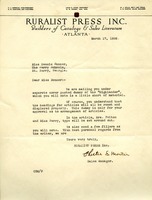 Martin addresses Bonner as "Miss Berry Bonner". 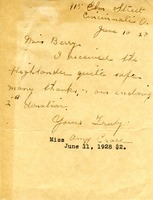 Letter from Amy Grace to Miss Berry in appreciation of receiving a Highlander and enclosing a $2 donation. Change of address notification from Geo. C. Stibbins notifying of the change of address of the Highlander. 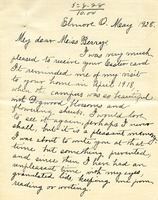 Miss H.W. Pearsall sends clothes that she hopes will be useful and the teachers can wear. 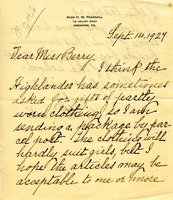 Mrs. LeBlond writes that she has just returned home from Calif. to find a Highlander. She expresses her sympathy about the dormitory fire and sends a small $25 contribution. 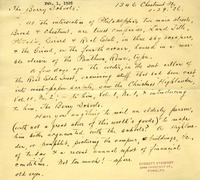 Mr. Holt thanks Miss Bonner for sending him reprints of "The Fame of Berry" and asks her to send more literature, including the "History of the Berry School," "Pilgrimage to Berry," the Fall 1926 Highlander and documents written by Maude Gardner and John Henry Fulghum. He also asks when the Silver Anniversary celebration will be held, and explains that it may be difficult for him to attend because of the Episcopal Diocesan Convention, but promises that he is more interested in The Berry Schools than ever. 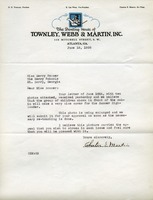 Erwin A. Holt hopes that the Silver Anniversary of the Berry Schools went well. He also requests that an extra copy of the Highlander be sent to him. 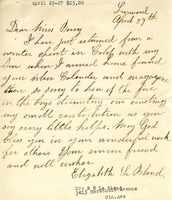 Miss Charlotte Heyman writing to Ms. Berry about a small donation and adoration of the Southern Highlander. 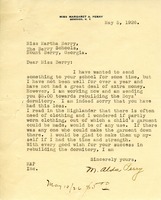 In this letter Miss Perry sends five dollars to help rebuild the Boys' Dormitory. 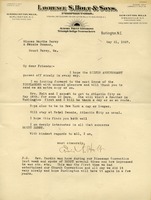 Mr. Martin writes to Besse Bonner to inform her they have checked the engravings from the last Highlander and that those cuts that were made were returned as well as the left overs. 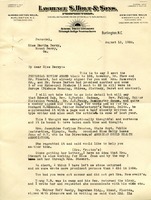 Martha Berry thanks Mrs. Ross for her response to the appeal in the HIGHLANDER for help at Christmas. 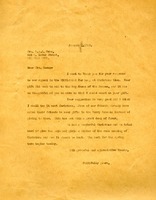 Mrs. Ross suggests that friends send gifts to the Berry Schools instead of giving to them. Martha Berry likes this idea and plans to suggest it next Christmas. 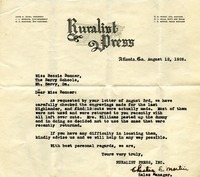 Letter to Bessie Bonner from Chester E. Martin, of Ruralist Press Inc., informing her that they are mailing a "dummy" copy of the Highlander for her approval. They inform her that it is short of material and that the headings for the article will all be reset and displayed properly. They also inform Miss Bonner that they will need a few fillers for the issue.